Reserve Bank of India (RBI) has released admit cards/ call letters/ hall tickets for written examination which is scheduled on 04th February 2014 against application notification through advertisement No. 1 /JE/2014‐15 for 38 vacant posts of Junior Engineer in Civil and Electrical. 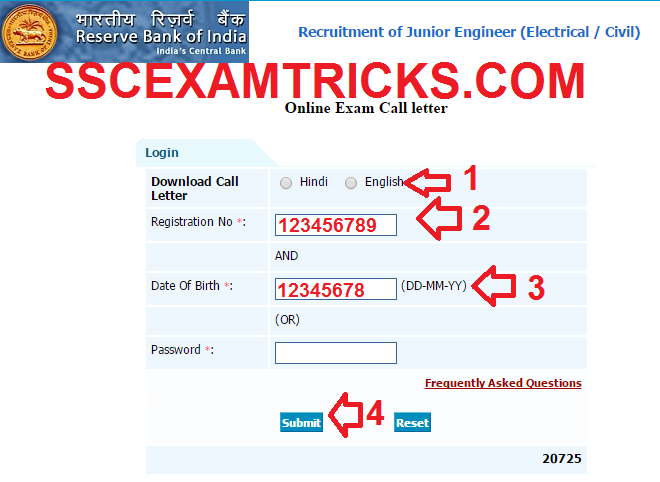 A huge numbers of candidates had applied for these posts.The Latest News is that those candidates who have applied for RBI Exam 2015 and are waiting for ONLINE admit cards can download their Call Letter/Admit Card from the direct link provided below. The RBI JE Exam will be conducted on 4th February 2015. The RBI JE EXAM 2015 will be conducted by Pen MODE. The exam was conducted an objective multiple choice question paper of 150 questions of 200 marks to be done within 2 hours or 120 minutes. The exam was consisted of four sections contains questions of English (50 questions of 50 Marks), Engineering Subject Questions (50 Questions of 100 Marks) and General Awareness (50 questions of 50 marks). The exam was a multiple choice question paper in which four options were provided out of which candidates need to choose one correct answer. There was 1/4th negative marking for each wrong answer. For more information candidate must download syllabus and exam pattern of RBI JE EXAM from the official website. The qualified candidates will be called for 2nd stage which is interview stage. Three times more than required candidates may be called for interview. Click here to download Complete Exam Syllabus of RBI JE Exam 2015 in PDF.